Many years ago, in the magnificent Louisiana Modern Art Museum in Copenhagen, I happened on a old poster of a 1976 exhibition by David Hockney still on sale in the gift shop. It was a simple charcoal drawing of a white armchair in front of a French window with flowing white curtains. Framed, it’s been hanging in all the various flats I’ve lived in since then (I just checked on eBay: it’s sold as a “rare museum poster” for about 200 euros). It never ceases to fill me with peace. After that, I looked for Hockney in every museum of modern art I visited. I saw steps and pools, portraits and flowers, and while my first Hockney love was a black and white drawing, later I was mesmerized by his use of colour, like for instance the deep changing blues of his “Mount Fuji with Flowers” (also hanging on my walls). But never had I been so smitten as I was when I visited “A Bigger Picture”, the exhibition on show this spring – until April 9th – at the London Royal Academy. It captures you from the very first room: on the four walls, four gigantic paintings depict the same three trees at Thixandale in Yorkshire, in spring, winter, summer and fall. It serves as an introduction, because the theme of the whole exhibition is nature, and particularly trees, the ever-changing seasons, and the power of renewal. The intensity of these trees and their colours physically hit the viewer and set the mood. 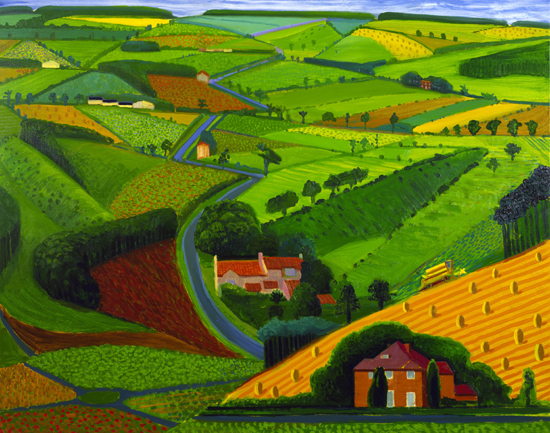 “A Bigger Picture” is a story about the landscapes of Yorkshire, Hockney’s native land. But also about other landscapes the artist has painted in his long career – from the amazing red Grand Canyon views to some hauntingly beautiful roads in California, the place where he settled thirty years ago. In his later years, for a variety of reasons, the artist – born in 1937, you do the math- was drawn back to his roots, under the ever-changing Yorkshire skies. The beauty of nature in this corner of Northern England (much celebrated in literature, from the Bronte sisters to James Herriot’s veterinary stories) clearly captured him with a charm which was multiplied by his memories (as a boy, Hockney used to work as a farm hand during the summer). In the huge Royal Academy exhibition the works from the Yorkshire years are divided by theme. 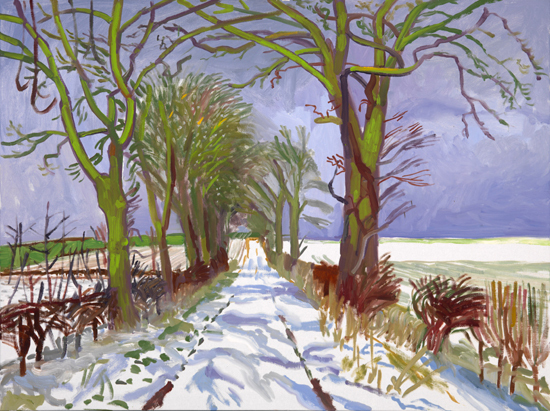 Hockney, a great admirer of Monet’s art, has repeatedly painted the same scene in different seasons. A tree tunnel on a countryroad. The Woods in Woldgate – paintings divided into six squares, easier to manage in the open air. But also visual narratives: a set of watercolours of summer fields; the arrival of spring, day-by-day in a specifica area. Several canvases on the flowering in spring of hawthorne blossoms. You follow where he leads. Losing yourself in Hockney’s vision of the world with his delirious colours and his multitude of different techniques for watching reality is enough. So apparently simple, almost naïve, and so uniquely complex, bursting with life. And here is the thing with Hockney’s colours: at first they look like primary colours, beautiful but violent. They then ask you to come closer and you end up sinking into them, endlessly nuanced; vibrant on the foreground, melting in the softest green and mauves, as the view deepens into the far perspective. Watching the BBC documentary “A Bigger Picture” by Bruno Wollheim (on sale at the Royal Academy website or in the RA shop, if you can jostle through the huge crowd frantically acquiring mementoes), you can admire the artist himself in the act of creation, his infectious laughter often provoked by the knowledge that an external eye is there to follow him. It is fascinating, because of Hockney’s vibrant personality (he emerges as a lovable man, full of understated humour, utterly absorbed and distracted by painting), because he works so swiftly, and because you can watch his vision of the view emerge on canvas. Which is not, by and large, the vision the onlooker had in the beginning. Light, seasons and different times of the day change our perceptions; a cathedral, a river, the nympheas in Monet’s experience. But what better frame than the ever-changing Yorkshire skies? 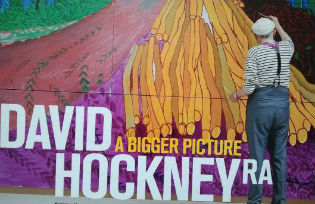 Hockney himself admits that every viewpoint is individual. But they are not all equally fascinating. When the artist sees space, utter beauty and colours and manages to show you what he saw, you cannot help but envy him. The exhibition is an act of love and a huge enterprise with many forays into the use of different technologies, from the “Brushes” app Hockney has been working with for years on his iPad (on YouTube there is a video of him drawing on the iPad in the Louisiana Café), to the filming of videos focused on the Yorkshire landscapes. Technology has played a big role in Hockney’s art in the last decades. Technology is a double-edged sword: it can immobilize your viewpoint, but it can help to multiply it to a cubist vision of reality. Which is what the videos screened at the end of the exhibition do, showing images of the Yorkshire woods from the car scrolling mesmerizingly from right to left on a screen separated into twelve different squares, imperfectly joined. The big paintings of the exhibition, too, are all divided into several canvases (and not always perfectly joined at the seams, adding to the fragmentation of space). Hockney works from observation, memory and imagination. Photography in particular has played a huge part in his work. Many of his portraits were taken from photographs, and in the Nineties he worked on a book, “Secret Knowledge: rediscovering the lost techniques of the Old Masters”, to explore the fascination that past masters (like Vermeer) had with the earliest forms of optical devices for observing things. But is photography the best, or even the most faithful tool to capture reality? In the Wollheim film, the artist says it all: “I’m painting landscapes in Yorkshire because you can’t photograph them. The camera can’t get the beauty of this. The space, I mean. We’ve simply got to a point where we think a camera can photograph anything. Well it can’t. It can’t really compete with painting at all”. Photography may fix the instant, but it cannot give you the marvellous feeling that the view you’re looking at, when painted by Hockney, is changing before your eyes. There are previous examples of the use of photography in the exhibition to fragment the view rather than to establish it. 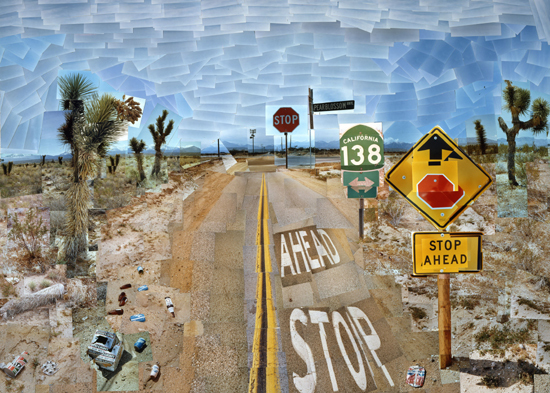 A stunning landscape from 1982 (a time when Hockney was using photographic collage), “Pearlblossom Highway” depicts a Californian road in a cubist, multiple-viewed vision, with its collage-composed multilayered sky, the details fractured by the eyes of the painter. Hockney had originally decided to abandon photography when he came back from Los Angeles to Yorkshire in 1997 – to assist his friend Jonathan Silver in the last months of his life. He then painted his first Yorkshire landscapes since his youth, taking inspiration from the daily drive between his mother’s house (she was then still alive) and his friend’s. The resulting six artworks, painted from memory, are among the most beautiful of the exhibition in my opinion: partly because they have a dream-like quality in the details and the richness of their colours. Another, much bigger, group of paintings come from 2004-2005, all from observation, quickly painted beside Yorkshire country roads (Hockney had moved his whole household, his assistant Jean Pierre, and his companion, John ,to his mother’s house). Several huge paintings were completed later specially for the exhibition. Among them the gigantic “Bigger Trees”, which Hockney has donated to the Tate Gallery, but which was originally conceived for the widest wall at the Royal Academy. It is so huge he had to rent an industrial unit and have a special wall built to mount it – all fifty canvases of it – and check it out before sending it to London. There, too, technology helped during the composition phase, with Hockney’s assistant pasting together reproductions of the canvases on the computer screen. Today, as in different periods of his career, Hockney is playing with influences from the past. In this Landscapes exhibition – apart from the explicit homage to Monet – most impressive is the ever-present fascination with details referring explicitly to the art of old Masters. Attention to background details translates, in modern terms, into the exquisite masterpieces of Italian and Flemish renaissance with their faraway, precise perspectives (in Hockney you find clouds and hills and skylines in sharp detail against a background of impressionistic trees and bushes). A whole section of the exhibition is in fact dedicated to the “Sermon on the Mount”, masterpiece from 1656 by French painter Claude Lorrain. The painting sits in the lovely Frick Collection in New York (small but so wonderfully rich and compact). 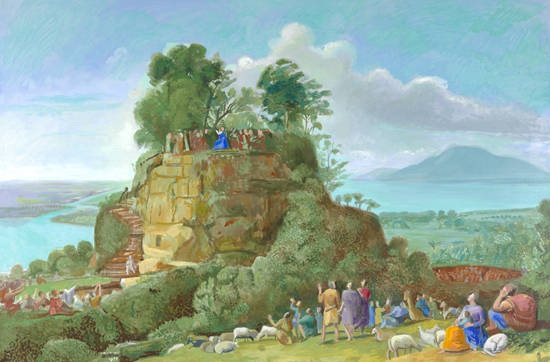 During a visit in 2009 Hockney was struck by the way Lorrain compressed the geography of the Holy Land into the background , managing to pack in Mount Lebanon, the Sea of Galilee, the Dead Sea and the river Jordan. He digitally cleaned the painting and made several different reproductions studying the depiction of space. And every time you think you’ve seen it all, that he must start repeating himself in this massive creative output, and the effect must pall, Hockney hits you with something spectacularly new: the slate-blue of a road in winter, a pale-pink road in autumn, the true colour of the summer sky, the Van Gogh dazzling swirls of a field, a sky composed of clouds so delicately nuanced you can lose track of time. Hockney talks of a Chinese saying: “Painting requires three things: the arms, the eyes, the heart. How very, very true. I believe it”. He invites us all to observe nature through the seasons: “Your own garden may change as much”, he is quoted as saying in one of the exhibition panels. Yes, but – leaving aside the arms – you might not have eyes and heart enough to really see it. Thanks for trying to teach us – how to look.